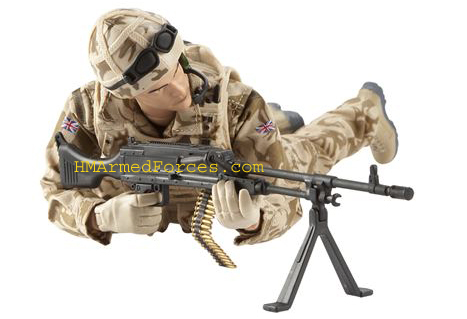 The first two two brand new HMAF figures for 2010 have been released to add to the HM Armed Forces Action Figure range. First up is the new HM Armed Forces RAF Regiment Gunner. The Regiment Gunner, similar to the already available HMAF Army Infantryman and Mortarman Action Figure, wears the removable desert combats complete with combined body armour and patrol vest. One very welcome difference however is the fact that on this figure the helmet, which is based on the actual Mark 6a combat helmet, is removable rather than the earlier HMAF figures with their moulded helmets. The other big difference is in the weaponry. The Regiment Gunner comes complete with a replica loaded General Purpose Machine Gun accessory with folding tripod. Just the sort of kit the real Regimental Gunners, or ‘Rock Apes’ as they are colloqially known, require on the kinds of missions they are highly trained for such as securing and holding the terrain around operational airbases.